The end of August and the beginning of September are an interesting transition period. Some are going back to school after the summer break, and others back to work after the long weekend. But unlike many years in the past, no one has the certainty of the hockey season to look forward to. As of right now that means no training camp, no preseason, and no home opener (upside: no drawn out ceremony at the ACC). For reasons discussed ad nauseam, September 15th is growing rapidly closer as the date when hockey fans can the kiss regular scheduled start of this NHL season goodbye. Some will look to other sports to fill the void. Others to video games like the new NHL 13, or to recreational hockey such as shinny or men's league (both of which I greatly encourage). For me, it will be a mix of all of these things, but for now, it seems best to try not to get caught up in the drama of it all. And this brings me to the main topic of this blog. The other day, amongst satiating my need to watch hockey in some form, I stumbled across these videos (Part 1 & 2) and spent 20 minutes or so reliving some great Leaf memories, specifically from the 2001-2002 season. This will be best appreciated by Leaf fans, but enjoy regardless; my thoughts/commentary are below. Not for the first time I've found the rosters of Leaf teams in the early 2000s quite enviable for their mix of talent and grit. 2001-2002 saw coach Pat Quinn run four lines consistently, each with their own clear purpose. 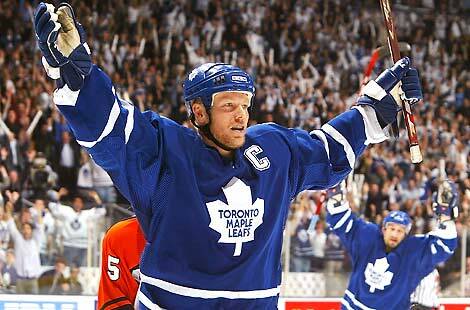 With scoring punch provided by the legendary Mats Sundin (who finished 4th in league scoring that year with 80 points), in addition to a somewhat mix and match compliment of players including Mikael Renberg and Robert Reichel, and of course Alexander Mogilny. In an NHL still arguably built on 'enforcer-enforced' accountability, the Leafs possessed a few 'tough customers' with the likes of Shayne Corson, Tie Domi, and Gary Roberts, all of whom had the skill to pot a few goals here and there (Roberts obviously more than the other two). This combination allowed the '01-'02 team to finish one point behind Boston at the end of the regular season and beat the Islanders and the Senators in two legendary 7-game series'. Despite the heartbreak of running into a red-hot Artūrs Irbe in the conference finals, the Leafs would go as far as we, the fans, have seen so far in the 21st century. While watching only the highlights of any team or player can cast them in a greatly positive light, both clips brought to memory the chemistry in some of the line combinations and pairings put together by Pat Quinn. For example, its astounding to see the number of time any combination of Mogilny, Roberts, and Sundin connect for beautiful goals, in an NHL where the amount of physical impediment made passing a very valuable asset. On the topic of Alexander Mogilny, a favorite of mine on Leafs of old, I was amazed to rediscover that he scored 76 goals in 77 games in the '92-'93 season, but remember clearly his speed and soft hands (paid nice tribute to here). He was yet another great player plagued by injury throughout his career, but one of the few who saw success coming to Toronto later in his career (see Owen Nolan, Eric Lindros etc.). Finally, Gary Roberts remains a name hallowed throughout Leafs Nation, especially for his heroics in the playoffs of this season. With 19 points in 19 games, Roberts proved to not only be an embodiment of the word 'clutch', but also a physical force to be reckoned with, likely causing some Sens fans nightmares to this day. Playing to the ripe old age of 43, Roberts' incredible conditioning allowed him to continue to be effective long after the average age of retirement for an NHLer. Now he provides hope once again for Leafs Nation, in his off-season training of Nazem Kadri, leaving all of us hoping for another Stamkos-esque success story. Final note: If you want a great drinking game, take a shot every time Joe Bowen says "Holy Makinaw" in the two videos. If you make it through the first video, you're not human. A life long Leafs fan who shares a down-to-earth perspective on the team and the game in general. Has played every EA SPORTS NHL game since '95.